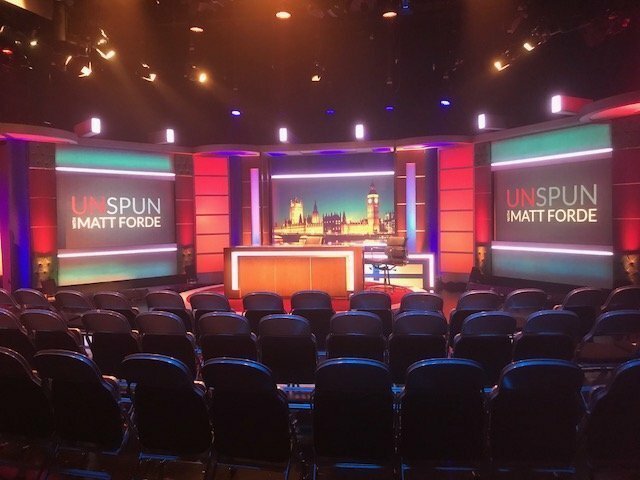 Martin Kempton returned once again to Richard Martin Lighting to source the equipment for the new series of ‘Unspun with Matt Forde’. This up-to-date satirical show is back to channel ‘Dave’ and with Guest comedians Matt Forde celebrates the best and worst of Parliament for the week. 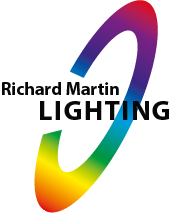 Martin Kempton designed the lighting, based at the London Studios, Martin said “we used Auras because they are really great for lighting sets due to the range of colours they produce, which includes rich saturated hues and subtle pastel shades. Their beam angle also makes them ideal to highlight parts of a set or given an even wash over a large area. The VL1000s are excellent lights to use as keylights in interviews as they can be shuttered off the set and adjusted live if required. The Chroma Floods and Pixel Pars are some of the best lights for using on the floor to up light part of the set with a wash or a streak of colour”. All of the above helped along with the use of Sunstrips, Jarag-L, Pixel Line 1044 and LED Beams. Lighting was focused largely on Matt Forde but Martin also had to integrate his weekly guest comedians and not forgetting the one and only parliamentary rock group MP4, members of the band which are all serving or ex members of Parliament the job, throughout all of this Martin has managed to keep the look fresh doing the set justice as always!